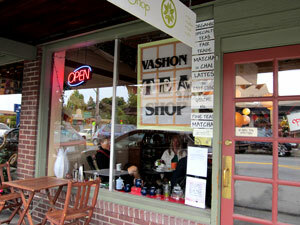 The Vashon Tea Shop is a warm, inviting place in the heart of Vashon. The delicate fragrance of tea greets the visitor when he or she enters. Nestled between a bookshop and an art gallery, we provide a place to sit with friends and family to enjoy a cup of tea. Delicious treats such as apple strudel, fruit bars, banana bread, pumpkin bread and a variety of cookies tempt the tea or coffee drinker. Light lunches are also available and include such yummy dishes as Paul's Miso Soup, a cheese plate with two kinds of cheeses, apple slices, crackers and chutney, quiche or Paul's Sushi Bowl with rice and smoked salmon. Customers meet with friends to while away the time or simply come to read one of the books they have purchased at the Vashon Bookshop next door. While they are waiting for their tea and treats, they can enjoy the art displayed on one of the walls or survey the delightful gifts available for the tea or coffee connoisseur. We carry a wide range of gifts from inexpensive change purses and book markers to tea cups, teapots and tea and coffee presses. Naturally, we carry all the implements a customer needs to enjoy their tea at home: tea infusers, measuring spoons, and timers designed to steep one's tea in the perfect amount of time.